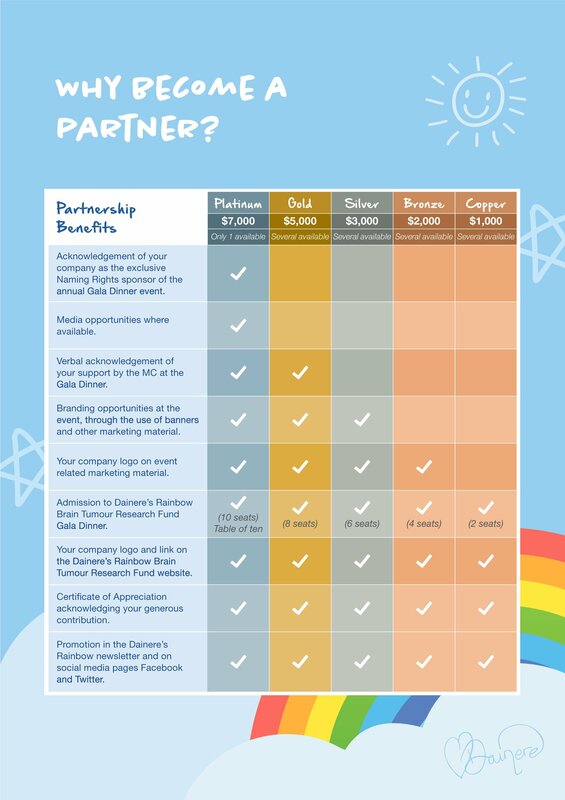 Dainere’s Rainbow Brain Tumour Research Fund was created in conjunction with Sydney Children’s Hospital Foundation in memory of our most beloved, courageous, inspiring and selfless Dainere who left footprints on so many hearts throughout the Canberra Community and beyond. We would be humbled and grateful if any businesses or individuals would consider partnering with Dainere’s Rainbow. If you are interested in a Partnership for our Gala Event or Partnering to support any of our other events or projects you will be making a difference and immensely assisting in Dainere’s greatest wish in life of a cure being found for this most horrendous disease. We offer several tiered Partnership Packages as well as the option of Community Partnership, allowing you to make a contribution at your preferred level point. Your contribution will give your company the opportunity to increase your community participation and to develop an association with an important cause and a well respected organisation. Additionally, attendance on the evening, provides a platform to network with fellow business and political leaders in the local community. Alternatively, if you can’t see something that is right for you, we would be happy to discuss further opportunities, so please do not hesitate to contact us.